YDCCF aims to show how local changes can make a global impact. Jack Creek Habitat Restoration Project, Phase I - completed spring 2018. Cast Hope, Chico, California: Cast Hope brings kids and mentors together through the sport of fly fishing. YDCCF’s funding will assist Cast Hope to host two fishing clinics and provide fly fishing equipment for 50 at-risk kids of San Diego County, California. Each youth will receive a rod, necessary flies, leaders, tippet, etc. Greater Gallatin Watershed Council: The Greater Gallatin Watershed Council (GGWC) works with local volunteers, landowners, and community partners to bring water quality monitoring, stream restoration, and watershed education to the Gallatin Valley with the goal of improving water quality for all. YDCCF funds will help GWC to hire a Big Sky Watershed Corps (BSWC) member and provides critical capacity for GGWC to implement the Gallatin Restoration Project Inventory, an effort to bring stream restoration professionals and stakeholders together to share resources, form connections and develop partnerships that will lead to the comprehensive and durable health and enhancement of our rivers and streams. Madison Conservation District, Ennis, Montana: YDCCF awarded a second grant to the Madison Conservation District to conduct Phase II of the Lower Jack Creek Restoration Project to restore and enhance riparian vegetation along Jack Creek and to improve in-stream habitat within Jack Creek by re-establishing riffle and pool stream structure. Implementation of this project will restore an ecologically functioning riparian corridor along the lower reach of Jack Creek that will allow for natural channel migration and sediment transport processes, and provide for improved in-stream habitat and increased shading along the stream channel resulting in a net increase in aquatic resource functions and services. Montana Wilderness School, Bozeman, Montana: The Montana Wilderness School provides empowering expeditionary wilderness courses to youth that foster personal growth and cultivate a conservation ethic through connecting with remote landscapes and wild places. YDCCF awarded a grant to assist with scholarship funding for deserving undeserved Montana youth ages 14-18 from Park County and Gallatin County to attend an MWS Expedition focusing on fishing. Wild Salmon Center, Portland, Oregon: YDCCF awarded a grant to the Wild Salmon Center (WSC) to support their Cold Water Connection Campaign on Washington’s Olympic Peninsula. WSC is partnering with Trout Unlimited and Coast Salmon Partnership on a multi-year project to engineer and correct 100 priority fish passage barriers, which will enable us to reconnect 150 river miles on some of Washington’s best salmon and steelhead rivers. With YDCCF’s support over the coming year WSC will: 1) complete an inventory and assessments on stream barriers in the Olympic Peninsula to fill an inventory data gap, 2) design and engineer up to 25 barrier removal projects on priority streams, and 3) develop a short film that highlights the ecological and human values of the coastal region to share with grassroots and grasstops constituents. Cayo Rosario, Belize: YDCCF awarded a grant to Ambergris Caye Citizens for Sustainable Development (ACCSD) to oppose the Belize Department of the Environment in approving the Cayo Rosario Development, and specifically the over water structures in a marine reserve. This is an important project addressing potential development threats to the marine reserve now and in the future. Guiding for the Future, Montana: YDCCF awarded a grant to assist the Fishing Outfitters Association of Montana (FOAM) to create a Montana “Guiding for the Future- Montana Fishing Guide Certification Program” providing advanced levels of knowledge and skill development for professional fishing guides. The program’s aim is to increase the guide’s professionalism and his/her leadership in aquatic resource stewardship, education, and advocacy. Further, the program demonstrates the commitment of guides, outfitters, fly shops, and the fly fishing industry to the conservation and wise use of Montana’s waters state-wide. Project Belize: YDCCF has developed a new partnership with the Bonefish Tarpon Trust (BTT) to help address the gill net issue and future development pressures in Belize. Project Belize is a collaborative, multi-year program to provide information directly applicable to conservation and protection of the flats fishery and habitats in Belize. With BTT, YDCCF has commissioned an economic analysis to identify important habitats and locations for conservation in Belize, and use this information to propose fisheries and habitat protections. The next phase of the project will be to help to establish an education program to build public support and understanding of the importance of the flats fishery and flats conservation to the country of Belize. Madison Conservation District, Ennis, Montana: YDCCF awarded a grant to the Madison Conservation District to restore and enhance riparian vegetation and improve in-stream habitat in Jack Creek, an important tributary to the Madison River. Stream and riparian restoration and enhancement activities will support existing fisheries values and provide opportunities for the re-introduction of Arctic grayling. Angler's Benefitting Louisiana's Estuaries (ABLE): ABLE is a non-profit organization that engages in coastal restoration and environmental education activities in Louisiana. The organization has been heavily involved in St. Bernard Parish, Louisiana, where the community's thriving commercial and recreational fishing industries are continually threatened by the degradation of its fragile coastal environment. YDCCF provided a grant to ABLE to engage local students in environmental education programming that will encourage good environmental stewardship along the community's vulnerable coast. The Taimen Fund, Mongolia: YDCCF provided a grant to assist The Taimen Fund (TTF) for their Riverkeeper program in the Eg Watershed, Hovsgol Province, Mongolia. The River Keeper Program is an ambitious anti-poaching project spanning a total of seven different villages throughout the Eg Watershed, along approximately 120 miles of river. The Riverkeepers employed in the program are local herders that spend a great amount of their time caring for their animals along the riverbanks of the Eg River and its tributaries. Toledo Exposure & Wil Mehia, Belize: YDCCF provided a second grant to help Toledo Exposure and Wil Mehia continue their efforts to patrol Southern Belize to monitor for illegal fishing. Funding will also support two PSA's to educate people about the setting of gillnets and how it affects the fishing and health of the fisheries. Torres del Paine Legacy Fund, Chile: YDCCF provided a grant to the Torres del Paine Lagacy Fund to enhance appreciation of, and minimize impacts on, the unique but fragile wetland ecosystems that comprise Torres del Paine National Park. With funding from YDCCF, the Legacy Fund will construct a boardwalk in a highly trafficked but sensitive segment of the popular “W” circuit, as well as design and install interpretive displays that communicate the critical features of the surrounding ecosystems to the estimated 80,000 outdoor enthusiasts that hike this iconic trail every year. 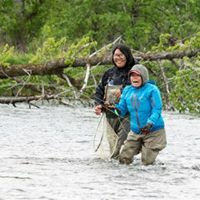 Chica de Mayo, Bozeman, Montana: YDCCF provided a sponsorship for Chica de Mayo, an annual women’s fly fishing event in Bozeman, Montana which encourages girl and women to fish. Punta Allen Primary School, Punta Allen, Mexico: YDCCF has awarded a new grant to the Punta Allen Primary School restore the roof of the palapa where the children eat lunch, and convert a storage room to a computer classroom. Yes for Responsible Mining, Montana: Yes for Responsible Mining is a coalition of Montana conservation and sportsman groups working to pass a ballot initiative in November 2018 that would allow the state the ability deny permits for new metals mines that would require perpetual water treatment to address surface water pollution from heavy metals and/or acid mine drainage. Guide Academy student Tatyana successfully coaches her “client” into her first fish on a fly rod.